We are honored that you are considering joining our faith community. We welcome all new members to our parish and hope that you will find a home at St. Patrick Church. We invite you to view our Mass Schedule, as well as the many Ministries available. Welcome! For a registration packet, please stop by the rectory office, located on the corner of S. Church St. and W. 4th St. in Wentzville, or call 636-332-9225. Office hours are 8:00 AM-4:00 PM, Monday-Thursday, 8:00 AM - 12:00 PM, Friday. You may also speak to one of our priests or deacons after Mass to receive your packet. If you are new to the Catholic faith and want to learn more about the teachings of the Catholic Church and the process of becoming Catholic, please visit Becoming Catholic (RCIA). If you are returning to the practice of the Catholic faith after being away, please visit Returning Catholics. If you have any questions, please stop by the rectory office, located on the corner of S. Church St. and W. 4th St. in Wentzville, or call 636-332-9225. Office hours are 8:00 AM-4:00 PM, Monday-Thursday, 8:00 AM - 12:00 PM, Friday. New to the Catholic faith or need a refresher? Check out "The Unofficial Newcomer's Guide to the Church." Our Sunday Visitor (OSV) Newsweekly answers questions on the Mass and other Catholic practices. 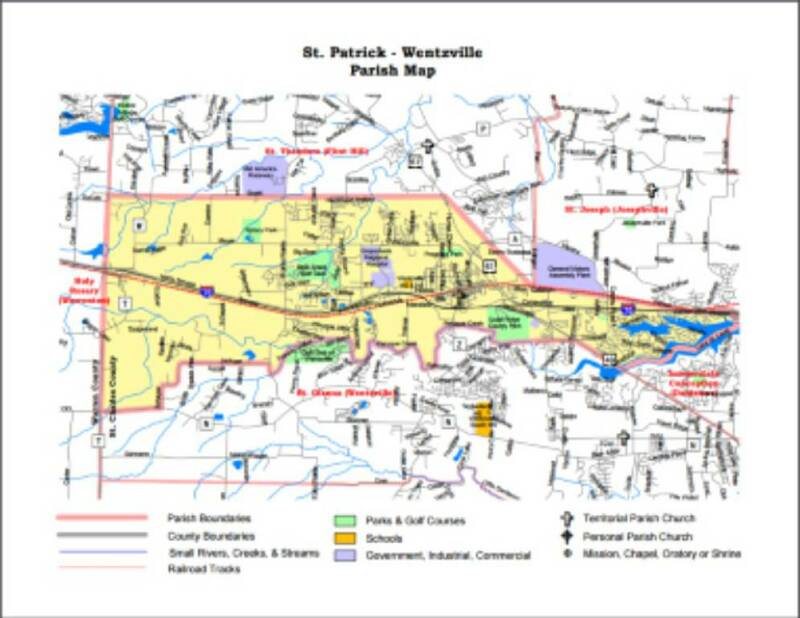 Please check the map below to see the St. Patrick Parish boundaries or visit the Archdiocese's parish directory. If you live in the boundaries of another parish, you are asked to contact the parish where you live and, as a courtesy, notify them that you will be joining our parish and they will send a confirmation letter to us. We understand that many churches offer an online registration form. However, we at St. Patrick Parish would prefer to welcome all new parishioners either in-person or over the phone.